hmmmm peter is so gentleman...! Peter said many times that he and Nara are only "good friends", but the public rather regard them as "a happy couple", because they are so cute and suited to each other. Yesterday I happened to see Peter on TV. It was an interview, Peter said he once was stumbled by himself on the T stage when he was modeling for a fashion show. However, he stood up and pretended that nothing have happen. Next, he talked about another funny thing: many actresses had to stand on a box to match his tall figure when shooting film ( such as Dong Jie). "I think it's a frensh experience for her to stand on a box as playing drama.....I often bend my back when talking with others, it's a bad habit. Now I may be two cm shorter than before....."
banlong, yesterday I also saw Peter on Phoenix TV. 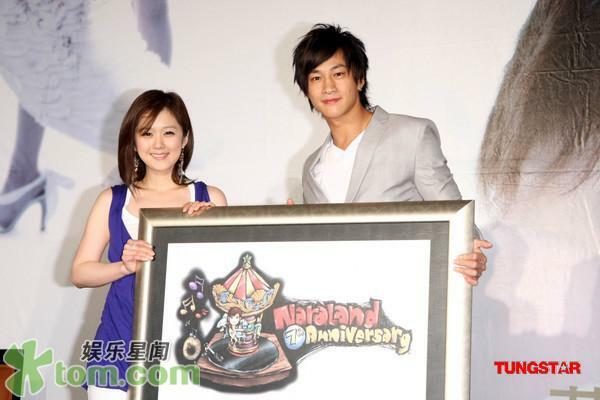 Peter said that he came to support Nara who also supported him when he launched his album. Nara said that she was so surprised to see Peter coming. She felt very glad that Peter came to support her. It's also said that Nara's father doesn't like Peter's underpants' CF. The female MC said that Peter once thought about the possibility to have a relationship with Nara, but the chance to meet each other is so little. So, the possibility is not big. Peter & Nara have dinner together with Kris, Tammy, etc. Do you notice the words on Jianhong's T-shirt? It should be two names of Chinese food. I don't notice the words on jianhong's tee if you don't tell me. I can only read the word "niu" means cow Is that rite? Yes, I see that Nara hasn't put any make-up.